Journal of the House of Lords: Volume 19, 1709-1714. Originally published by His Majesty's Stationery Office, London, 1767-1830. Message to H. C. with it; and Hill's Bill. Sir J. Shaw versus E. Torrington. Act for discharging the Yule Vacance, to repeal, Bill. Content Galley, a free Ship; Bill. Epus. Meneven. Ds. Harcourt, Custos Magni Sigilli. Viscount Kilsyth. Ds. North & Grey. Hodie 3a vice lecta est Billa, intituled, "An Act for Sale of Part of the Estate late of Edward Hill Esquire, deceased, in Orton and Rowell, in the County of Northampton, for the discharging several Incumbrances thereupon, and the Performance of the last Will of the said Edward Hill; and for the settling of other Lands and Tenements in Rowell aforesaid, in Lieu thereof, to the same Uses." 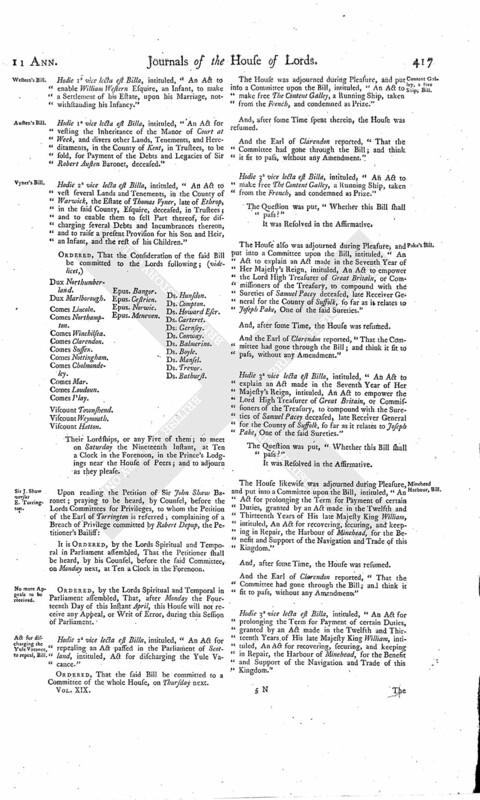 Hodie 3a vice lecta est Billa, intituled, "An Act to enable Owen Thomas Bromsall Gentleman to sell divers Lands, Tenements, and Hereditaments, in the County of Bedford, for the Purposes therein mentioned." Hodie 1a vice lecta est Billa, intituled, "An Act for the erecting a Corporation for the speedy finishing the Hospital, and establishing, perpetuating, and Management of the Charity of the Skippers and Keelmen of the Town and County of Newcastle upon Tyne." Hodie 1a vice lecta est Billa, intituled, "An Act to enable William Western Esquire, an Infant, to make a Settlement of his Estate, upon his Marriage, notwithstanding his Infancy." Hodie 1a vice lecta est Billa, intituled, "An Act for vesting the Inheritance of the Manor of Court at Week, and divers other Lands, Tenements, and Hereditaments, in the County of Kent, in Trustees, to be sold, for Payment of the Debts and Legacies of Sir Robert Austen Baronet, deceased." Hodie 2a vice lecta est Billa, intituled, "An Act to vest several Lands and Tenements, in the County of Warwick, the Estate of Thomas Vyner, late of Ethrop, in the said County, Esquire, deceased, in Trustees; and to enable them to sell Part thereof, for discharging several Debts and Incumbrances thereon, and to raise a present Provision for his Son and Heir, an Infant, and the rest of his Children." Their Lordships, or any Five of them; to meet on Saturday the Nineteenth Instant, at Ten a Clock in the Forenoon, in the Prince's Lodgings near the House of Peers; and to adjourn as they please. It is Ordered, by the Lords Spiritual and Temporal in Parliament assembled, That the Petitioner shall be heard, by his Counsel, before the said Committee, on Monday next, at Ten a Clock in the Forenoon. Ordered, by the Lords Spiritual and Temporal in Parliament assembled, That, after Monday the Fourteenth Day of this Instant April, this House will not receive any Appeal, or Writ of Error, during this Session of Parliament. Hodie 2a vice lecta est Billa, intituled, "An Act for repealing an Act passed in the Parliament of Scotland, intituled, Act for discharging the Yule Vacance." The House was adjourned during Pleasure, and put into a Committee upon the Bill, intituled, "An Act to make free The Content Galley, a Running Ship, taken from the French, and condemned as Prize." And, after some Time spent therein, the House was resumed. And the Earl of Clarendon reported, "That the Committee had gone through the Bill; and think it fit to pass, without any Amendment." Hodie 3a vice lecta est Billa, intituled, "An Act to make free The Content Galley, a Running Ship, taken from the French, and condemned as Prize." 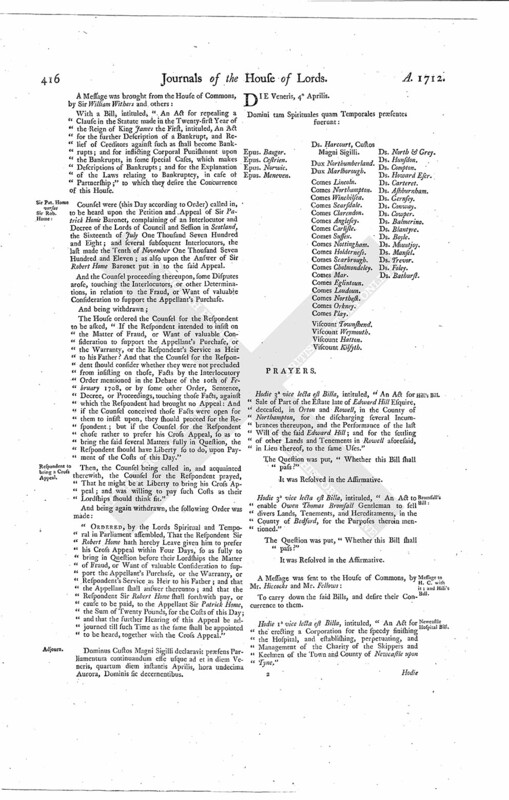 The House also was adjourned during Pleasure, and put into a Committee upon the Bill, intituled, "An Act to explain an Act made in the Seventh Year of Her Majesty's Reign, intituled, An Act to empower the Lord High Treasurer of Great Britain, or Commissioners of the Treasury, to compound with the Sureties of Samuel Pacey deceased, late Receiver General for the County of Suffolk, so far as is relates to Joseph Pake, One of the said Sureties." Hodie 3a vice lecta est Billa, intituled, "An Act to explain an Act made in the Seventh Year of Her Majesty's Reign, intituled, An Act to empower the Lord High Treasurer of Great Britain, or Commissioners of the Treasury, to compound with the Sureties of Samuel Pacey deceased, late Receiver General for the County of Suffolk, so far as it relates to Joseph Pake, One of the said Sureties." 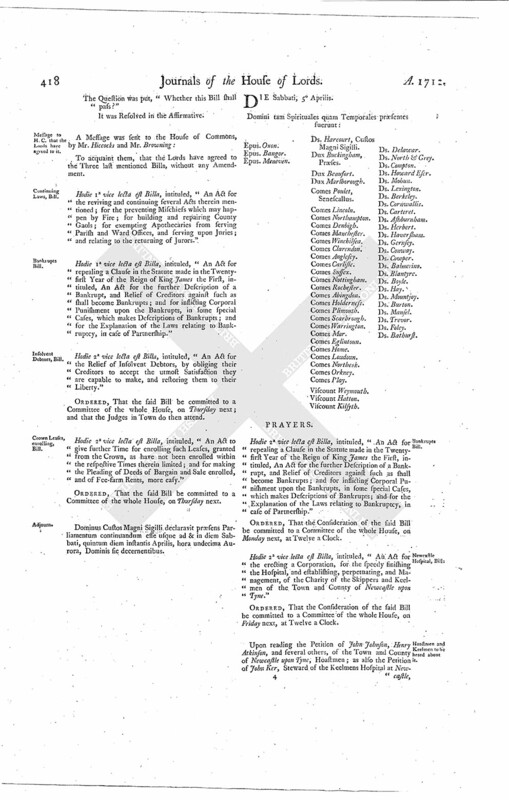 The House likewise was adjourned during Pleasure, and put into a Committee upon the Bill, intituled, "An Act for prolonging the Term for Payment of certain Duties, granted by an Act made in the Twelfth and Thirteenth Years of His late Majesty King William, intituled, An Act for recovering, securing, and keeping in Repair, the Harbour of Minehead, for the Benefit and Support of the Navigation and Trade of this Kingdom." Hodie 3a vice lecta est Billa, intituled, "An Act for prolonging the Term for Payment of certain Duties, granted by an Act made in the Twelfth and Thirteenth Years of His late Majesty King William, intituled, An Act for recovering, securing, and keeping in Repair, the Harbour of Minehead, for the Benefit and Support of the Navigation and Trade of this Kingdom." Hodie 1a vice lecta est Billa, intituled, "An Act for the reviving and continuing several Acts therein mentioned; for the preventing Mischiefs which may happen by Fire; for building and repairing County Gaols; for exempting Apothecaries from serving Parish and Ward Offices, and serving upon Juries; and relating to the returning of Jurors." Hodie 1a vice lecta est Billa, intituled, "An Act for repealing a Clause in the Statute made in the Twentyfirst Year of the Reign of King James the First, intituled, An Act for the further Description of a Bankrupt, and Relief of Creditors against such as shall become Bankrupts; and for inflicting Corporal Punishment upon the Bankrupts, in some special Cases, which makes Descriptions of Bankrupts; and for the Explanation of the Laws relating to Bankruptcy, in case of Partnership." Hodie 2a vice lecta est Billa, intituled, "An Act for the Relief of Insolvent Debtors, by obliging their Creditors to accept the utmost Satisfaction they are capable to make, and restoring them to their Liberty." Ordered, That the said Bill be committed to a Committee of the whole House, on Thursday next; and that the Judges in Town do then attend. Hodie 2a vice lecta est Billa, intituled, "An Act to give further Time for enrolling such Leases, granted from the Crown, as have not been enrolled within the respective Times therein limited; and for making the Pleading of Deeds of Bargain and Sale enrolled, and of Fee-farm Rents, more easy." Dominus Custos Magni Sigilli declaravit præsens Parliamentum continuandum esse usque ad & in diem Sabbati, quintum diem instantis Aprilis, hora undecima Aurora, Dominis sic decernentibus.